Also, because about half of all kicks in Denver in any given season are by the same kicker, I restricted the data to visitor kick attempts. Here is how the field goal success shakes out. Kicks in Denver do indeed have longer range, to the tune of about 5 yards. I did some research myself on this a year or so ago. I don't have the data in front of me right now, but if I remember correctly Denver was 3rd in all stadiums in terms of average yards per field goal attempt. Would be interesting to look at touchbacks, since there are no situational factors. I was there for a preseason game this year and couldn't help but think that kickoffs are pointless in Denver. Although it makes sense, how many years of data is this? Is there a Sebastian Janikowski factor because he plays at Denver twice a year? I've got to echo the concerns about sample size - it seems like most of the difference would be at ranges where teams would be reluctant to kick. On the topic of field goals, it seems like the rate is proportional to the square root of the distance from the 48. How is it that completion goes to zero beyond 46 yards? There are certainly been completed kicks from that range. Also percentage beyond 41 yards seems very low across the board. Janikowski only plays at Denver once a year. The flip side is that there are only 8 games a year in Denver, so he should account for roughly 1/8 of all visitor FG attempts over the last 13 seasons. Then, if we estimate that Janikowski's range is roughly 8 yards better than the average visiting kicker, he would boost the average range by about a yard. So at most, we should reduce the Denver boost from 5 yards down to 4 yards to account for this. That's line of scrimmage. So 46 yards is a 63-yard kick (line of scrimmage + 7 for the holder + 10 for the end zone). I'm surprised that the results are so inconclusive, though I guess I shouldn't be. Kicking "farther" doesn't change the result of the vast majority of kicks because the distance is makable, and for long kicks they seem to miss to the left and right (i.e. direction) as for distance. It would only effect that subset of straight kicks from the limit on the kicker's range. One can simply look at Matt Prater, Bronco's kicker known for his great range. He is 62-76 = 81.6% in Denver, he is 54-68 = 79.4% on the road as a Bronco (this is 2008 - 2012). That sample seems large enough to say no significant difference in overall FG%. However, that is not the correct way to look at the situation. 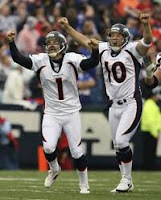 If you pull out prater's longest FGs, we see that of his top 20 successful kicks, 12 were at denver, 8 were on the road. Including a 56 yard FG, 54 yarder, a 53 yarder, 52, etc. (and kicks 21-23 were all on the road too, in fact in top 27 kicks, the road takes the lead). This is not inconsistent with there being no significant effect of Denver's altitude on FG kicking. While not an effect in FGs (looking just at Prater), the touchbacks do indeed have a huge Denver effect. Denver at home = 85.19% TBs, while on the road Denver has road = 42.22% TBs. A huge difference, and I would submit that TBs are much more responsive to the altitude due to simply depending on distance, and not direction or defence, etc. The next highest road or home percentage is 72, so that 85 is well above the other team numbers. An excellent point by Ryan above, to look at TBs. Unlike the cold weather factor, sportscasters always talk about how it's easier to kick long field goals in Denver. Therefore coaches are more willing to attempt longer kickers that are at the edges of their kicker's range. Also a tiny note: isn't it often cold in Denver? Are the Denver numbers and the under 30-degree numbers co-mingling? ASG, was just about to post the same thing. Perhaps domes on the road help with FGs and erase any altitude advantage from denver. Elam has a 63 yard FG in Denver, but 4 of his longest 7 kicks were on the road. And that is from over 400 kicks. I think the analysis above is pooched simply due to that one single successful FG in the 46-50 bin. There is, but the air is still much denser on a hot humid day in Miami than a cold dry day in Denver. Baseballs and frisbees don't curve as much at altitude, so perhaps in addition to flying farther, kicks are straighter, too. I also wonder whether a similar study on kicking at Heinz Field wouldn't come to the conclusion that being near the confluence of three rivers depresses field goal performance. On this site, I'm equally impressed by the comments written and disappointed by the author's absence. Is the difference between the trendlines for Denver and Everyone Else statistically significant? Joshua Perry-It breaks my heart that you are disappointed by my absence. It's about 24 hours since this post went up, and here I am responding to comments. I think you'd have a happier life adjusting your expectations downward a bit. I'm curious what you think I do all day. -Yes, temperature matters, a lot, as I've previously documented. But as stated above, the analysis above only looks at kicks in moderate temperatures. That doesn't completely eliminate all bias, but it's a relatively straightforward way to mitigate the vast majority of it. -It's absurd to say "the analysis above is pooched simply due to that one single successful FG in the 46-50 bin." (First, some advice. I discount any comment that uses the words clearly, obviously, or simply without explaining why things are so clear, obvious, or simple.) On the contrary, if we truncated the chart at the 35, 40, or 45-yd line, we'd see the same 5-yard advantage in Denver. The analysis does not rely on 1 single case. Throw that data point out, and the results would be unaffected. That's exactly why I like showing the data and analysis graphically instead of typing out a table of regression results. You can literally see the differences and the variances for yourself. You can make your own judgement, but, Anonymous, yours is clearly, obviously, and simply wrong. -Janikowski would have an effect, slightly stronger than other kickers because of the selection bias due to his tendency to have long range attempts. Still, you can see the same consistent effect throughout the shorter-to-middle distances. It would be easy to exclude all OAK attempts and replot to test. Good point. -Great point on the TBs. And thanks for doing the number crunching on that! -I'll dig up the sample sizes for each bin and post them here. I did this analysis over a year ago, so it will take a little time to dig through my spreadsheets. You can make your own judgement, but, Anonymous, yours is clearly, obviously, and simply wrong." I disagree with your opinion. Why do you say it was absurd? Not only do i think it is not absurd, i don't see any evidence that it is wrong. Here are the facts: It seems that the last bin is zero for everyone. (that's the problem with graphs, we have to guess). ok, for the second to last bin these are the LoS from 41-45. Switching over to FG distances 58-62 yds, there have been only 12 successful kicks over 60 yards, of which two were in denver (elam, janakowski). For some reason, the 63 yd FGs are falling into this bin. For these kicks over 60 yards, there is no evidence that denver helped in any systematic way. In fact, as i posted Elam's longest kicks split evenly among road and home kicks, and janakowski's longest kicks occurred everywhere - his next 14 longest kick were not in denver at 54 yards. And, with Elam and Janakowski, we have kickers who played a lot of games in denver. Add in the analysis of Bronco kickers, and the fact that they have no systematic advantage on the road vs in denver. The conclusion that denver adds 5 yards to your FGs range is not valid. The peak in the 36-40 bin is noticeably larger than non-denver, but how can one possibly explain it being larger than denver 31-35? This statement is a bit tongue in cheek, but the only conclusion one can draw from that graph is that if you at the 31-35 yard line, take a 5 yard penalty and move back to improve your FG percentage by 20 points. This also applies to 21-25 yard line, teams should move back to the 26 yard line to kick the FG. "-Great point on the TBs. And thanks for doing the number crunching on that!" You are welcome. In my opinion, kickoffs are one of the few (the only?) consistent and repeatable situation that occurs often enough to get some quantitative analysis out of, and it does indeed show what would be expected from the physics: that distance increases. Kickoffs do not depend on accuracy, or defensive players, or have other decision making implications. "...if we truncated the chart at the 35, 40, or 45-yd line, we'd see the same 5-yard advantage in Denver. The analysis does not rely on 1 single case. Throw that data point out, and the results would be unaffected." Weak. Very weak, Mr. Anonymous. Kick other people's sand castles all day if you like. It's also apparent you don't understand sample error. Let's agree on the following: The data is consistent with what we already know to be scientific fact about ballistic travel of projectiles through viscous fluids, and leave it at that. ...data "are" consistent... Pardon me. That does not address the alleged "absurdity". You only have two points in each curve, that is hardly convincing, especially when the next point (31-25 bin) show a very strong opposite conclusion. Let's examine this in some detail, using numbers rather than 'absurd and weak weak weak". First, it is closer to ~1.5 yards, not 5. Draw a horizontal line from the blue curve to the yellow curve. It is much less than half a bin-width. Second, You can 'truncate at 30" and see that kicking in denver costs you yards. You can truncate the chart at 20 yards, and denver costs you yards again. Obviously, if your argument depends on where you make a cut-off, it is not a valid argument. Also, you list too many cases, 45,40,35. There is no data at 45 so that is not a third case - all three results are equal to zero. I posted a polite and detailed analysis regarding the question, if you would like to address those points please do. Your erroneous conclusion is probably based on how few long kicks there are especially when you have reduced the data with your arbitrary rules. I am guessing you have about 2 kicks per year in your analysis of the 41-45 bin. What are the numbers for the attempts and the successes in the bin for 36-40, and 41-45 for all three cases? Why did you leave out the bronco kickers? and how do the results change with them in? (i know prater is better with 50+ kicks on the road than in denver (69% in denver 86% on the road)- but not significantly so if you look at the full ratios instead of percentages). The comparison is between Denver and other outdoor stadiums. You want to compare w/ the red line, not the blue (domed) one. I just ran a query and found 122 field goal attempts in Denver at 41-80 degrees by non-Denver teams since the 2000 season. I found 7587 attempts by non-Denver teams at stadiums other than Mile-High. In that data, I don't see any compelling indication that field goal performance is better at Mile-High, though that may well be because the data is so sparse -- especially at the longer ranges where the difference would be more apparent. thanks 2nd anon, but it would be to both the domed and outdoor lines wouldn't it? I assume denver is not included in the red line, even it was it would have a very small effect. It is interesting that both the domed line and denver line have that unusual increase in FG% at 36-40 yards. The red line (outdoor) is the only curve that falls off nicely with distance, which one would expect given lower kick trajectories and having the FG posts subtend a smaller solid angle (i.e. smaller target) as well as the great distance. Is there a need to control for an artificial vs. natural vs. hybrid playing surface? Denver uses a hybrid surface (Desso GrassMaster) that only two other NFL teams (Packers and Eagles) currently use, so there probably isn't sufficient data to rigorously account for it in this instance, but if there is an effect, it would be good to know the magnitude. > Is there a need to control for an artificial vs. natural vs. > hybrid playing surface? Possibly, but it's difficult. The NFL has a relatively small number of stadiums with a large variety of surfaces and surface substrates. Baseballs carry about 5% further in Coors Field, according to Robert Adair's The Physics of Baseball. Baseballs are much more spherical and denser than footballs, so maybe the air density would affect them less than a football, but a 5 yard difference on a 40 yard field goal on a football would be mean that the air density difference would be 2.5 times more impactful on a football than a baseball. A different physicist calculates that a baseball loses less speed in Denver, but only by 1%. I don't see that adding five yards to a field goal. Anonymous with the personality disorder--You're looking at the wrong line. That orange Denver line in the chart is based off some really small counts. Each bucket in the 54 and shorter FG interval is, on average, 27 attempts. The 40-44 yard FG over the last 12.5 seasons: 30 kicks, 8 misses, for a 73% success rate. The 45-49 numbers: 31 attempts, 5 misses, for a 83% success rate. Just 3 extra misses account for the sharp drop at the 40-44 number. Is the turf at the 23 yard line especially slippery? Let's try a control sample, not listed in the chart: Denver FG kicking. At 40-44, 39 kicks, 8 misses, 79% success rate. From 45-49: 29 kicks, 10 misses, 65% success rate. Denver kickers seem to find that 5 yard stretch of the field much friendlier. Or, a difference of just 2 additional misses produced a large % difference. 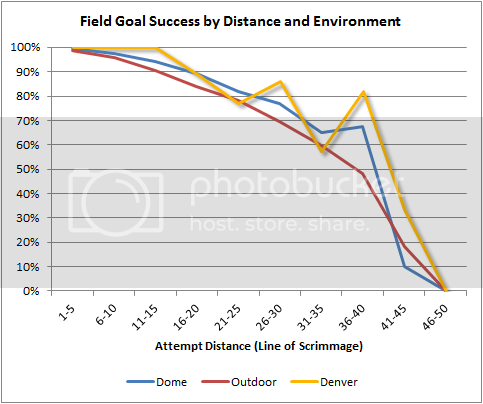 I don't think you can use FG%, at least in the Brian tried, to measure how much further a football travels in Denver. Like others, I'd be interested to know the sample sizes here. It would be interesting to come up with a model based on temperature and humidity, using all the (non-Denver) outdoor stadium data, and then see if applying those numbers to Denver smooths out the data at all. My guess is no, but it depends how many samples are in each bin. For touchback data (and FG accuracy data, for that matter) the direction they kick matters. I'm not sure I've seen a single kickoff return from the north endzone (kicking from south to north) all year. It's not an automatic touchback kicking from north to south. Chris-Even if this analysis were entirely based on a mere 27 attempts alone, that would be considerable. Everyone should remember that significance is proportional to the square root of increasing sample size, not with linear sample size. A total of 124. Removing OAK's attempts, it's 113. > square root of increasing sample size, not with linear sample size. The square root of 27 is around 5.2. So a crude confidence interval is +/- 20%, which is bigger than the spikes on the chart. FWIW, there are more close attempts. In my data set, in Denver, by visitors, in the temperature range, I only see 5 attempts with the line of scrimmage in the 36-40 range, and 3 in the 40-50 range. Big fan of the site, but not impressed by Brian's aggressive replies. Can't one just make a linear regression or probit/logit model here? Could a difference-in-difference technique be utilized? To talk of percentage vs. percentage is pretty meaningless as there are so many factors overlooked (omitted variable bias, so to speak). We can control for a lot of things, home-field advantage, temperature, wind, game situation, elevation, field surface, etc. How big of a sample can we get? If you get me the data, I'll do it. Doesn't take too much to get a rough outline of what is happening. Look, some of you guys are looking for a doctoral thesis here. You're not going to get it. You're going to get a couple-hundred word blog post and a graph of the raw data broken presented for reasonable-person comparison. As a bonus you get a rough estimate of about 5 yards, which is perfectly consistent with what we've always observed over the years in Denver. Kent, those controls sound really nice, but trust me, once you start dicing up the data into little bits like that you're going inject all kinds of model-induced error. The data is freely available going back to 2002 if you're still keen on it. Fred, I'll be completely honest with you. There is a certain percentage of know-it-all nerds that love to try to knock down statistical straw men to make themselves feel smart. I get them *all the time* around here. They're transparent. Note the comment from the primary antagonist who was *so disappointed* I hadn't responded to the comments within 24 hrs. If he genuinely wanted to hear my response, he'd have written, "Brian...any response to the above?" You don't need to read minds to know that guy is a dork with an agenda. He probably spends his day leaving highly critical reviews all over Amazon. Note my concluding claim in the original post: "Kicks in Denver do indeed have longer range, to the tune of about 5 yards." 'To the *tune* of *about* 5 yds' is the appropriate estimate given the surface level analysis done. It doesn't even claim causation. It's just that visitor kicks in Denver have been longer than other outdoor stadia. That certainly indicates there's something special about Denver. If someone wants to argue with me that it's magnetic fields or warlock magic, and not the air density, have at it. But seriously, grow up and save your pathetically transparent "disappointment." This is a site for people who are serious about learning things about football. It's not a stage for dorks with personality disorders to preen their statistical acumen. Fair enough point about some of the comments. I guess years of responding to them would get tiresome for anyone. You are providing a really good service that a lot of people enjoy. Of course, by stating your opinions and analyses, you are always going to have idiots who want to chime in and try to beat you by presenting a "better" analysis on the same data. I would just let your intelligent fans see through the stupidity of your stupid fans. I would say that it's bad business, but as I recall you didn't start this thing up for money. Either way, I think it is an awesome site. In my first round of Las Vegas golf I hit a 327 yard drive straight down the middle of the fairway. That was about 30 yards further than I had ever hit before. Since then, whenever I play in Vegas, I really try to crush the ball, as I know (in my head) that this could be the longest drive ever. I did several years later beat my longest drive by 16 yards, but I'm sure that my average (less psychologically pressured) drives elsewhere amount to higher totals. There's also the performance impact of thin air on the visiting teams and the conversly "blood-doped" performance that high alititude conditioned athletes have in lower alititude environments. Plus- at higher elevations the thinner atmosphere provides less radiant energy shielding. Players are exposed to more gamma radiation ar Mile High then elsewhere. According to Dr. Banner, this could have a profound impact to kicking a football.